"it's this weather... bringing back lazy memories"
and I said, oh! that makes me want to write a poem? The past year has been pretty hard for me, too many transitions to count. Not to mention that my roomie of 4 years was no longer there every day to hug and bug and pray with. Job hunt, the grad school fiasco, family things, church stresses, but through it all I knew I could talk to you. Thanks for all the times you waited and prayed anxiously with me for news about all the happenings in Nor Cal and for calming me down during those roller coasters. It must have been hard making time for me amidst getting the life forces sucked out of you by the educational leech also known as the UCLA MSW program, but please know I truly appreciated it. Okay. This is cheesy, but whatever. I love you so much, my darling Ronny baby bunker boo. I thank God everyday for matching us up freshman year! Yippee yai kai yay! Ok, time to get ready before class! Being a student is so hard especially during Week 8 of SPRING quarter... we're all just counting down until summer... or in my case... GRADUATION! YEEEAAA YUHHHHHHHH! Waiting for my Easytones is not an easy thing to do. I just bought new Reebok Easytone shoes. I AM SO EXCITED. I actually saved up to buy them, so I am impatiently waiting for them. Eeek! Please pray that I can stay calm and patient as He gets it all ready!! Taking care of babies is HARD work, so you should all REALLY thank your mommas for putting up with you (and your dads too, today and next month!). Well. That makes me depressed. 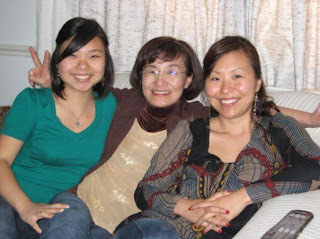 I just found out that the last time I took a picture WITH my mom was WAY too long ago... ;_; But, until I get home and bombard her with my camera, enjoy the pics of my beauuuutiful mother, who taught my sister and me to be strong women who can do anything! :D Just like herrrrrrrrr!! !